WebSitePulse underwent a standardized scoring procedure, where it proved its ability to improve the efficiency of business operations with real-time monitoring. Our system stood out among other IT management software reviews also because of its fast development and notably good traction with current customers. 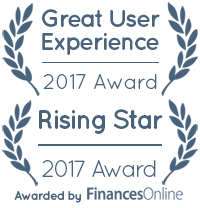 Thanks to its powerful features, but also the notably fast development compared to other young systems, our system got named the 2017 Rising Star. To make matters even better, experts ascribed it another great recognition, namely the Great User Experience Award reserved for systems that give users a friendly and intuitive monitoring environment, and offer reliable support whenever needed. WebSitePulse was also mentioned on the top list of IT management software for 2017, strongly recommended for detecting transaction breaches and inconsistencies. The system was discussed as a smart alternative for businesses looking to reinforce email delivery, as it performs email round-trip monitoring, and captures easily both delayed and lost emails. Experts were also impressed by the system’s ease of use, account administration, and custom monitoring that makes it suitable for any business or concerned website owner.